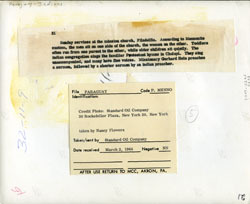 Description: back of 2007-0202; "21 Sunday services at the mission church, Filadelfia. According to Mennonite custom, the men sit on one side of the church, the women on the other. Toddlers often run from one parent to the other, while older children sit quietly. The indian congregation sings the familiar Protestant hymns in Chulupi. They sing unaccompanied, and many have fine voices. 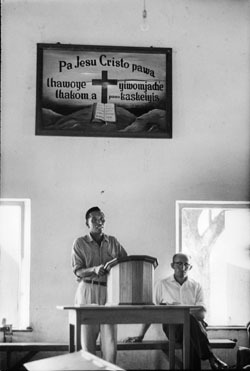 Missionary Gerhard Hein preaches a sermon, followed by a shorter sermon by an indian preacher."